Bearded dragons are one of the most popular reptile breeds, and with good reason. With a laid-back attitude, bearded dragons rarely bite and love to interact with humans, which makes them a great option for children. Unfortunately, not all bearded dragons you see in pet stores are healthy. Learn what to look for so you choose a pet that will be a companion for many years to come. Bearded dragons are active during the day. Look for one with bright eyes and who notices when you walk into the room or look into the tank. Bearded dragons are often very proud of themselves and will stand tall, with their heads in the air. If the animal is slumped in the corner or otherwise unresponsive, you'll want to avoid that pet. Sadly, bearded dragons are often sold before they're ready. Born in large clutches, there will be ones who don't thrive, so inspect each animal carefully before purchase. 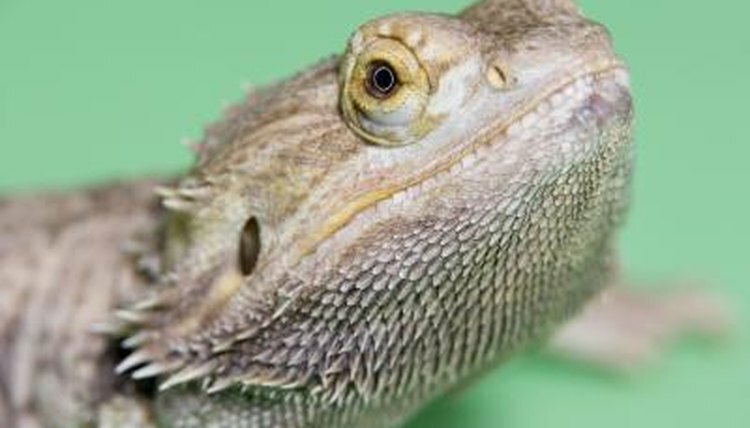 A healthy bearded dragon will have a pink mouth and tongue. If the mouth appears blackened or discolored, the dragon isn't being housed properly and has developed a condition called mouth rot. Mouth rot is a result of the reptile being kept in temperatures that are too low and a habitat that isn't being cleaned properly. A dragon with mouth rot will need veterinarian care in order to survive. A healthy dragon will also be interactive. Bearded dragons love attention so much that they will dance back and forth, trying to get your attention. Choose one who responds to you and seems like he wants to be handled. Ask to hold the pet to see if he continues to be interactive. He may try to run because the breed loves to explore, but an active dragon is a healthy one. Other signs of illness include a discolored stomach, sunken eyes, shriveled skin, a bloody or mangled snout, jerky behavior, a bony appearance, disfigured limbs or swollen limbs and tail. Note that darkened or dull skin may not always be the sign of a health problem. Juvenile bearded dragons shed frequently as they grow. Handle the dragon and if the skin sounds papery, there's a good chance he's about to shed. Why Is My Bearded Dragon's Arm Waving? Which Types of Bearded Dragons Make the Best Pets? Why Do Geckos Have a Neck Pouch?